Pakea Jr (inside), under jockey Kevin Cabajal, holds off Jessa Cat (#8) to win the $8,000 Turf Paradise Maiden Stakes (not black type) Sunday afternoon at Turf Paradise. PHOENIX, AZ—JANUARY 27, 2019—The lightly raced Pakea Jr got his first career win Sunday when he defeated Jessa Cat by a neck in the $8,000 Turf Paradise Maiden Stake (not black type) at Turf Paradise. The fastest two qualifiers from the January 13th trials, One Famous Icon and One Sweet Boogie, were both scratched. Ridden by jockey Kevin Carbajal, Pakea Jr completed the 300 yards in :15.542 seconds, a 94 speed index over a fast racing surface. Owned-and-trained by Eddie Megariz, the New Mexico-bred son of leading sire Jesse James Jr has compiled a (4) 1-0-2 record. He picked up $4,811 for today's effort, bringing his bankroll total to $5,105. Dirk Jones bred the chestnut colt from Pakea Kai, an unraced daughter of Mr Eye Opener and champion mare Rule The Deck. Jessa Cat, a daughter of Stray Cat from the Mr Jess Perry mare Jessa Runner, earned $1,552 for her second-place effort. Bumped slightly at the start, Jessa Cat is owned-and-trained by Jose Botello and was bred in Missouri by William Dale. 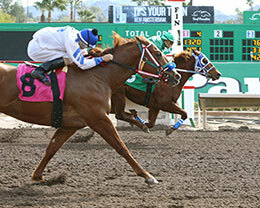 Second in the AQRA Turf Paradise Futurity in December, the sorrel filly has earned $13,961. Emilio Tapia was riding the Quarter Horse granddaughter of former leading Thoroughbred sire Storm Cat. Hold On Jess, a daughter Mr Jess Perry racing for owner Bobby Simmons and trainer Joe Basset, finished one-length off the leaders to earn $776 for third. Saul Ramirez, Jr. rode the $2,608 earner out of Hold Me Now by Separatist. Balgo Racing Team, Inc. bred the sorrel filly in Oklahoma.